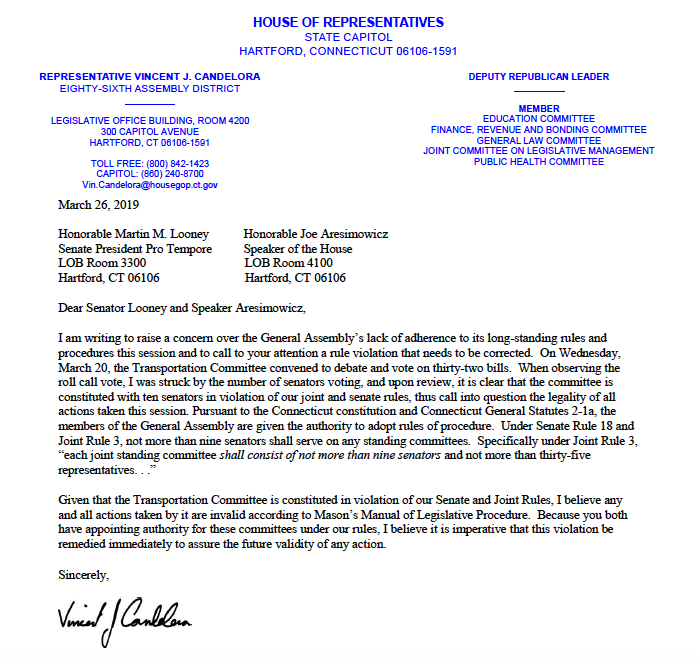 The Connecticut Transportation Committee has one too many senators and the actions it has taken may be invalid, according to a letter from Rep. Vincent Candelora, R-Branford, to leaders of the House and Senate. “Given that the Transportation Committee is constituted in violation of our Senate and Joint Rules, I believe any and all actions taken by it are invalid according to Mason’s Manual of Legislative Procedure,” Candelora wrote. Candelora notes in the letter that he was “struck by the number of senators voting,” during the March 20 meeting in which the Transportation Committee approved several tolling bills. According to the Rules and Precedents of the General Assembly of Connecticut, standing committees shall not have more than nine senators, except for the Appropriations Committee, the Finance, Revenue and Bonding Committee and the Judiciary Committee. The Transportation Committee currently has 10 senators, including seven Democrats and three Republicans. 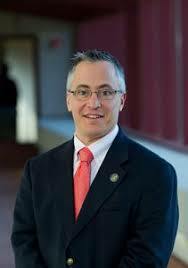 Candelora confirmed that he believes the actions taken by the Committee should now be invalid. The joint filing deadline for the Transportation Committee has already passed. It is unknown at this time how the rule violation could affect legislation the Transportation Committee has passed, but it is sure to add fuel to a fiery debate over tolls which has stirred intense feeling on both sides. But the imbalance of senators on committees is not limited to the Transportation Committee. Traditionally, the make-up of committees is balanced according to the party division in the House and Senate, but this year Senate Democrats hold far more seats than would be allotted to them based on their majority over Republicans in the Senate. The make up in the Senate is roughly 60 percent Democrat and 40 percent Republican, but Senate Democrats outnumber Republicans as much as four to one on the Higher Education Committee; three to one on the Labor and Public Employees Committee and six to two on the Education Committee, to name a few. How about an audit on state expenses and make cuts, like the 1.5 billion the state spends on illegals! We have families and veterans that are homeless and starving. Do the job you were elected to do, and that’s not raising taxes, you need to take fiscal responsibility this state was once great where it was admired by every state! What happened? It time to make Ct. great again! Isn’t that scary? Those we expect to create our state budget are incapable of figuring a 60-40 split of senators on a committee with a total limit of 9 except on what they consider major committees. hello people….. our government is a reflection of us. are we all that stupid? If these inequalities are in violation of constitutional organization perhaps this should be referred to the Supreme Court for an adjustment ruling..
Dosent Surprise Me…The Sadest Part Is That The Poorest of Connecticuts Citizens Have Been and will Continue To Carry The Heaviest Burden…Its Already Fight To Feed Your Chrildren in Ct for its poorest families…now lets add more burden….the ones making the rules dont have kids who go hungry….I can guarentee that…. No tolls. We want fiscal responsibility.